CAMP NAWIC 2018 WAS JUNE 4-8, 2018! ​AND IT WAS A HUGE SUCCESS! The 2018 Camp NAWIC Experience! 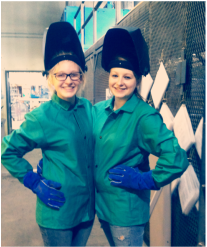 The National Association of Women in Construction (NAWIC) partners with the Kansas City Construction Industry to offer high school age girls an opportunity to learn in a hands-on FREE summer day camp the basic skills of carpentry, electrical, welding. Camp activities also include a field trip, tool demonstrations, and much more! Camp NAWIC registration is open on a first come, first served basis and we are limited to 24 participants. Click Here to See the 2018 Camp NAWIC Schedule! ​Follow Up After the 2018 Camp NAWIC! The young women who attended were from a variety of schools throughout the metro area. That is exciting! They learned about the daily routine of morning meetings, safety talks and then pre-task planning by doing these things from Day 1 of the Camp. Check out the schedule and you will see they had jam-packed days with just about every trade you can think of! Member of Chapter 100, and several of the unions who provided volunteers documented the activities throughout the week with pictures that were posted to our social media using the hashtag #CampNAWIC2018. Do a search - we're pretty sure there are at least 50 - 100 photos out there in cyberspace! Additionally, the Builders' Association provided video resources that we will be gaining access to soon! Can't wait to share that with everyone - past years videos look like the 'campers' have a blast! We just got a copy of the Modern Builder magazine produced by The Builders' Association and they have several pages devoted to Camp NAWIC! ​Thank you to all of the contractors, tradeswomen and chapter members who made this a huge success once again! More pictures and a video of #CampNAWIC2018 coming soon! 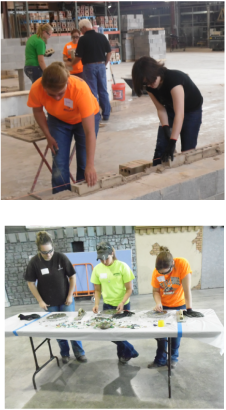 The Greater Kansas City Chapter of National Association of Women in Construction (NAWIC) hosted the 7th year of Camp NAWIC. This FREE week-long summer camp for high school girls is designed to offer real hands-on opportunities to learn the basics of safety, carpentry, electrical, painting, plumbing, concrete and welding. It also included a field trip to a construction site and female speakers from all aspects of construction; construction law, insurance, project management, etc. Each day of camp the girls focused on one or two skilled trade areas and were taught by certified instructors teaching with journey level women in that specific trade skill. Campers were challenged to learn skills they had never considered while having fun. CLICK HERE FOR A GREAT VIDEO FROM CAMP 2017!